The HTTP Strict Transport Security (HSTS) security enhancement specification provides a way to force modern browsers to communicate only via the Transport Layer Security (TLS) protocol. Once enabled, HSTS will force the browser to redirect (typically with a status code 307) to the HTTPS URL. NOTE: HSTS only takes effect after a site has been visited on a trusted HTTPS connection. It doesn't replace the need to have redirects from your HTTP site. Click the Force TLS and enable HSTS switch to force TLS and enable HSTS for the service. The request setting for forcing TLS and the header for enabling HSTS will automatically be created for you. WARNING: You may experience problems if you enable this setting along with the override host setting. Instead of enabling the override host setting, create a new request setting and specify the override host in the advanced options. If you'd like configure additional HSTS options, you'll need to manually enable HSTS by adding a new header as follows. NOTE: If you followed the instructions in the previous section, click the Force TLS and enable HSTS switch to remove the request setting and header that were automatically created. Follow the instructions in forcing a TLS redirect to force unencrypted requests over to TLS. Click the Create header button to create a new header. The Create a header page appears. In the Name field, type a human-readable name, such as HSTS. This name is displayed in the Fastly web interface. From the Type menu, select Response, and from the Action menu select Set. In the Destination field, type http.Strict-Transport-Security. In the Source field, type "max-age=<max age in seconds>". For example, "max-age=31536000". As described below, max-age is required and two additional HSTS options can be specified. Leave the Ignore if set menu and the Priority field set to their defaults (or set them as appropriate for your service). 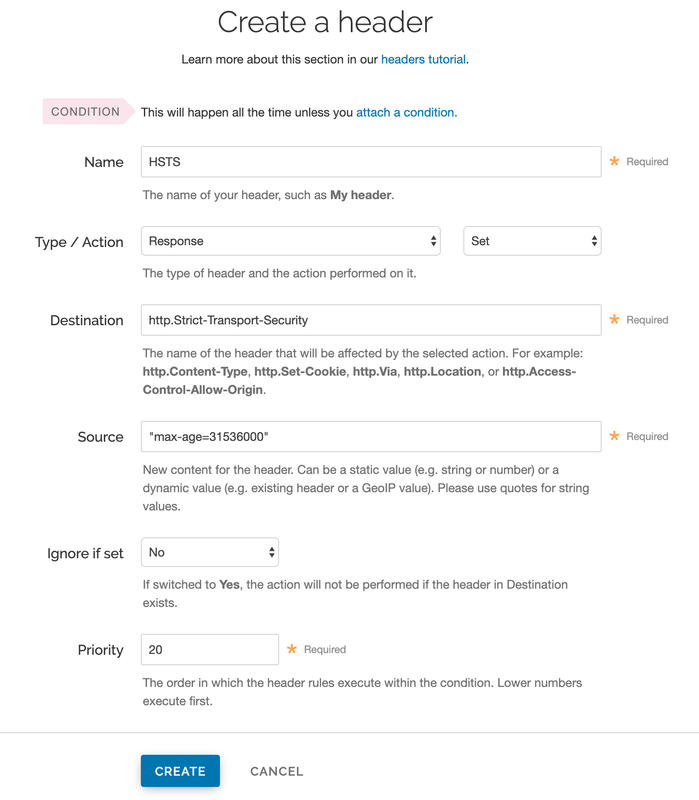 If you manually configured the HSTS header, you can specify additional HSTS options. HSTS requires the max-age directive be set in order to function properly. It specifies how long in seconds to remember that the current domain should only be contacted over HTTPS. The example shown above sets max-age to one year (31536000 seconds = 1 year). You may want to experiment using a smaller value than what is shown. includeSubdomains - This token applies HSTS to all of your site's subdomains. Before you include it, be certain none of your subdomains require functionality on HTTP in a browser. Ensure your TLS certificate is a wildcard or has coverage for all subdomain possibilities. IMPORTANT: All subdomains will be unreachable on HTTP by browsers that have seen the HSTS header once includeSubdomains is enabled. preload - This token allows you to submit your domain for inclusion in a preloaded HSTS list that is built into several major browsers. Although the token is not part of the HSTS specification, including it in the header is a prerequisite for submitting to this preloaded list. WARNING: Don't request browser preload inclusion unless you're sure that you can support HTTPS for the long term. Inclusion in the HSTS Preload List cannot be undone easily. See https://hstspreload.org/ for submission instructions and more information. "Strict-Transport-Security: max-age=<max age in seconds>; includeSubDomains; preload"
To disable HSTS for whatever reason, simply set the max-age to 0 on an HTTPS connection. The HSTS Preload List is managed by a third party, not by Fastly. See https://hstspreload.org/ for more information.